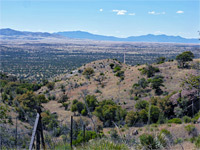 The most popular of the limited number of trails in Coronado National Memorial is the 0.4 mile route from the park road at Montezuma Pass to Coronado Peak, a minor, detached summit of the Huachuca Mountains, the top of which gives a fine, panoramic view over the monument and south along many miles of the international border into Mexico. 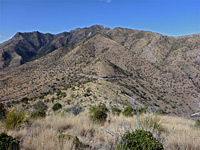 One junction near the start is with Joe's Canyon Trail (3 miles), a much less busy path that descends gently along a windswept ridge then more steeply down a ravine, rejoining the road near the visitor center, while another intersection about a mile down this route is with the Yaqui Ridge Trail, which leads due south, also dropping steeply down and ending after one mile right beside the border fence, marked by obelisk number 102, a point that is also the southern terminus of the cross-state Arizona Trail. The round trip to Coronado Peak then along the start of Joe's Canyon Trail and down the Yaqui Ridge Trail is 4.7 miles, with an elevation change of nearly 1000 feet. 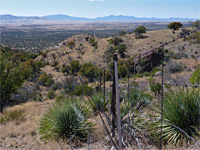 All the terrain is similar - open and largely treeless, the ground covered only by short grass and scattered desert plants, including Palmer's agave, Sierra Madre yucca, sotol and several varieties of opuntia. View from Coronado Peak. Full screen version (21 mb). From the visitor center, the paved park road runs along the floor of Montezuma Canyon for another mile, until the pavement ends, then climbs via several switchbacks, reaching Montezuma Pass (elevation 6,575 feet) after 3.3 miles, where there are parking spaces for several dozen vehicles. 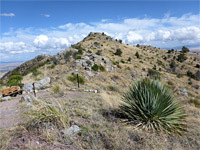 The Coronado Peak Trail heads south from the far side of the parking lot, climbing gently up a narrow ridge to the rounded summit, site of a metal ramada with several information boards describing places in view. Other notices back along the trail every 0.1 mile describe events during the Coronado expedition. The last section of the path is a little steeper, gaining height via a series of steps. Joe's Canyon Trail branches off 450 feet from the start and also heads south, along the east side of the ridge rather than on the crest. 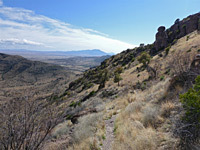 Several notices warn against taking a shortcut from the Coronado Peak path, and instead return to the junction, though there is a faint, unofficial trail leading east from the summit that does connect the two routes. In most places though the ridgeside is too steep, crossed by several lines of low cliffs. Joe's Canyon Trail then moves eastwards over more open ground for another half mile to the junction with the Yaqui Ridge Trail, marked with a bench and notice, just after a minor peak from which the ridge projects southwards. The trail runs just below the ridgeline to the east, descending fairly gently at first, to a rocky area, then more sharply via one switchback, over ground that has a covering of loose, slippery stones in a few places. 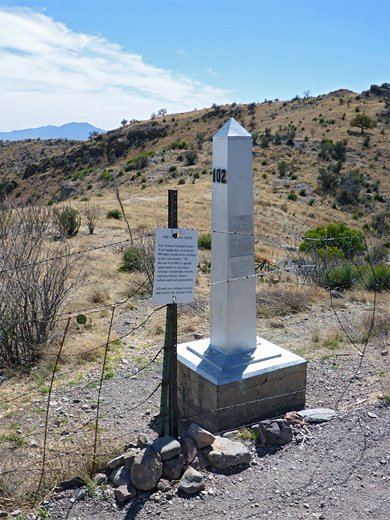 The path comes close to several cliffs and boulders of dark, breccia-type rock, then after the last outcrop it turns a corner and ends soon after at the international border, beside another bench, the obelisk and an Arizona Trail notice. The fence is formed only of five strands of barbed wire, and is partly broken beside the obelisk, so it is easy to cross into Mexico. 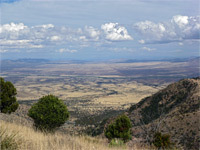 Yaqui Ridge continues descending and merges with the base of Cerro el Tejano, a small peak, but most of the land to the south is a low, flat plain, crossed by the dead straight boundary fence, the course of which is in view for many miles to the west.